1. Cut 3 slits into the skin of each mackerel and place skin-side up on a rack over a foil-lined grill pan. Place under a preheated grill for 4 minutes, turn over and cook for 1-2 minutes until just cooked throughout. 2. Meanwhile, heat the oil in a large frying pan and stir-fry the pepper for 2 minutes. Add the cabbage, carrot and grains straight from the pouch and fry for 2-3 minutes. 3. Stir the mayonnaise into the slaw, season to taste and add the parsley. 4. 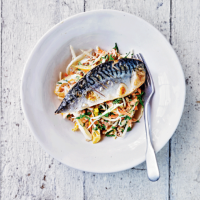 Serve the slaw topped with the mackerel.